New User Survey: Please Help Us Meet Your Needs! The results from our last survey (2012) are available here. Do not hesitate to contact us if you have questions. https://opennebula.org/wp-content/uploads/2018/11/opennebula_cloud_logo_white_bg-4.png 0 0 Ignacio M. Llorente https://opennebula.org/wp-content/uploads/2018/11/opennebula_cloud_logo_white_bg-4.png Ignacio M. Llorente2014-06-26 23:31:272018-11-26 11:45:10New User Survey: Please Help Us Meet Your Needs! As a company that has been in the hosting business for the past 17 years, Avalon has always had only one goal – to provide the best possible service to our customers. We are a premium web hosting provider and we are one of the largest providers in Croatia and the region, hosting more than 16,000 domains across Europe. Two years ago, we decided to build our web hosting platform entirely from scratch, using the best cloud technology that we could find. While searching for partners, it was extremely important for us to find the best among them and apply the best of their technologies enabling us to provide a premium level service to our customers..
We selected the IBM as a hardware vendor and became the IBM Managed Solutions Provider, building a complete infrastructure on the IBM System x technology. As almost 80% of our customers are using Linux hosting our perfect match was combination of CentOS Linux and KVM hypervisor. When considering cloud management solutions, we tried many well-known open source and some commercial cloud solutions, and after thorough testing we decided to choose OpenNebula as our foundation platform for future development of our cloud hosting services. We developed our OpenNebula cloud integration with Ceph, a distributed object store and file system which we found really impressive. – Today, that is the platform for our shared hosting and virtual server users, and we have over 6 month experience in production. We believe that OpenNebula with EC2 API support together with Ceph Storage, which is compatible with the S3 object storage, is a very good basis for the further development of our web hosting services, as well as many other services in the future based cloud technology. Next week in Zagreb, Croatia, on July 3rd at 10 AM, we are organising a press conference where the official launch of our hybrid cloud platform will be announced. I am very grateful to OpenNebula founders Mr. Ignacio M. Llorente and Mr. Rubén S. Montero, who are supporting us in this project, and we are extremely pleased that Mr. Constantion Vasquez, as a Senior Infrastructure Architect at C12G Labs, will attend as a speaker at the conference, introducing OpenNebula project to the Croatian media. In addition to Mr. Vázquez and myself, other conference speakers will include Mr. Damir Zec, managing director of IBM Croatia, Mr. Dobrisa Adamec, Microsoft MVP and Mr. Tomislav Bronzin, Microsoft MVP who will cover the second smaller part of our platform targeted at ASP.NET developers. We feel it’s time to remind our vision of a world that won’t be dominated by a single cloud management platform. We’re moving into a world of open cloud — where each organization can find the right cloud for its unique needs. A single cloud management platform can not be all things to all people, there will be a cloud space with several offerings focused on different environments and/or industries. This is the natural evolution, same happened in other markets like relational databases or the web servers. … you do not need an army of administrators to build and maintain your cloud. … you will run production-ready software that is fully open-source without proprietary extensions that lock you in. … your cloud will run for years with little maintain. … you can easily build a cloud to fit into your data center and policies. 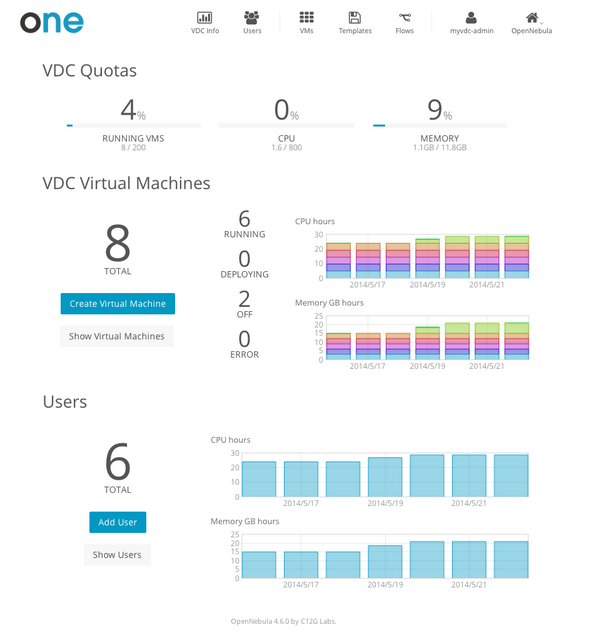 So before starting the migration from vCloud to vCAC, why do not you give a try to OpenNebula to manage your cloud platform?. Our community is willing to help you. https://opennebula.org/wp-content/uploads/2018/11/opennebula_cloud_logo_white_bg-4.png 0 0 Ignacio M. Llorente https://opennebula.org/wp-content/uploads/2018/11/opennebula_cloud_logo_white_bg-4.png Ignacio M. Llorente2014-06-16 23:27:402014-07-03 00:26:13Looking for Alternatives to vCloud for your VMware Infrastructure? As you may be aware, the OpenNebula Project is organising two Cloud Technology Days in US this month. The first one will take place in Boca Raton, Florida, the 19th of June, hosted by TransUnion, whereas the west coast will be covered by the Bay Area Techday the 24th of June, hosted by Hyve, which includes an exciting tour around the manufacturing plant of Facebook production racks. If you happen to be around and want to get to know the project and discuss OpenNebula or Cloud Computing in general, drop us a line and will schedule a meeting. You can use all press material from here if you want to. … make sure to register here until August 15th and support us with a great talk! And of course you can help us by being a sponsor! Everything you need to know about your sponsorship opportunities is here. We are also happy to hear from you whenever you have questions.